Do you ever get to the bottom of your “to do” list? Are there not enough hours in the day or days in the week for everything you need to accomplish? If not, Premier Domestic Concierge may be just the solution to simplify your life. Premier Domestic Concierge (PDC), located in Franklin, specializes in Residential, Apartment and Concierge services for a variety of clients who want top-of-the line, individualized 24/7/365 customer care. 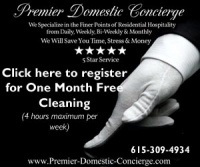 For Residential clients, Premier Domestic Concierge offers housecleaning – bringing back the old white glove treatment. Not only will you get first-class home cleaning, but you’ll also have complete trust in the staff doing the job. Each of PDC’s employees are screened and put through rigorous training, regardless of their previous work experience. In addition, housecleaners work in teams, ensuring your home is cleaned efficiently, thoroughly and left sparkling and bright. Just the way you want it. We also offer much more. Our team of courteous and attentive professionals can assist in managing your personal affairs or business needs, no matter what the project. Other services we provide include laundry and ironing, running errands, shopping, event planning, set-up and clean-up, handyman home maintenance, house-sitting, pet sitting, wait service and new mother services. We are available on a daily, weekly, bi-weekly or monthly basis. We can handle the details so your family can enjoy more leisure time. PDC’s Apartment Service is the ultimate property marketing and loyalty tool. We offer a high-impact marketing and loyalty program that helps attract, sign and renew residents by giving them 24/7 phone or computer access to a VIP concierge and information service – branded in your property name, of course. Ultimately, the personal concierge, value-added service attracts prospective renters, results in greater customer satisfaction and promotes your property with every call. We are bonded, licensed and insured and have 24/7/365 client access and support. Call Premier Domestic Concierge today and begin enjoying your life again, (615) 309-4934. Click here to register for one month of free cleaning from Premier Domestic Concierge (four hours per week maximum).